One of the most repeated rumours going on in the PEPLUM genre was that Alan Steel was Steve Reeves' stuntman/body double during the filming of THE GIANT OF MARATHON. This has always been confusing to me because 1 - Alan is an actor in the film so why would he be a stuntman for Steve? and 2 - both Steve and Alan have different body types. 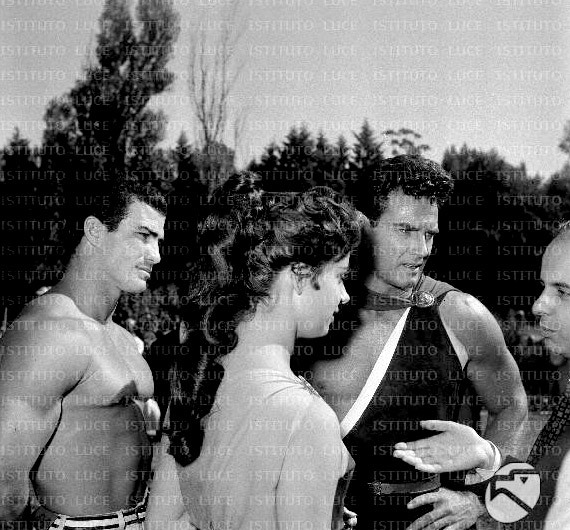 Below is an image of Steve Reeves held by Alan Steel (the fellow on the left) and you can clearly see that they have different physiques: Alan's is more burly while Steve (at that time of filming) was more slim and athletic. What is known is that Giovanni Cianfriglia has been Reeves' stuntman/stand-in/body double for most of his films so why would it be different for THE GIANT OF MARATHON? Well the answer to the mystery is in the photo above. That's the chiseled Giovanni Cianfriglia standing next to Steve (with Anita Todesco and director Jacques Tourneur). Giovanni is wearing regular modern day slacks which tells me he was doing stand-in work that day. This photo dispels the rumour that Alan Steel was Steve's stuntman for this film for good. Screenshot of the stuntman standing in for Steve. That's definitely not Alan Steel's physique.